Grains gapped higher in the overnight on U.S.-China News. Grains are currently stronger with beans up 15 cents, corn and wheat up 4 cents. Over the weekend the U.S and China agreed to suspend further tariffs for 90 days. If no agreement is reached within 90 days, higher tariffs, and additional tariffs, will be implemented. China has agreed to purchase a substantial amount of agricultural, energy, industrial, and other products from the US, with the purchase of agricultural products from U.S. farmers immediately. A killer pig virus that began spreading in China four months ago has picked up pace, causing at least one fresh outbreak on average a day this month and encroaching on major cities including Beijing and Shanghai. The New York Stock Exchange and the Nasdaq will be closed Wednesday, Dec. 5 for a national day of mourning for former President George H. W. Bush. The CME Group has not said if they will be closed or not. Today’s chart shows historical Brazilian soybean production (left axis, in million tonnes) and planted acreage (right axis, in million hectares), since 1987/88, with the average trade estimates (as compiled by Reuters) plugged in for 2018/19. 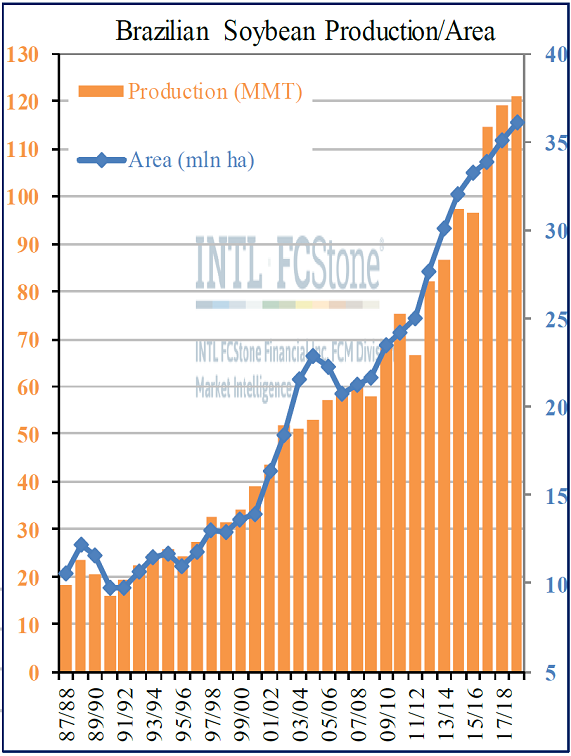 Those figures (121 MMT on 36.13 mln ha) are only a shade above current projections from both the USDA Nov S&D and INTL FCStone’s Brazilian team, but most expect estimates to rise across the board this month due to a strong early planting pace and fantastic weather.